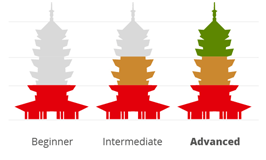 Welcome to the Advanced Level online chinese level test. It has been carefully designed to help you decide which course is best for you. Nice work! Your level is approximately Upper Advanced. Your level is approximately Middle Advanced.